There are a lot of iPhone users in the whole world and every time they change their old iPhone into a new iPhone, they feel the need to transfer the data from old to new iPhone. You must be facing the same problem and don't know how to transfer video from iPhone to iPhone X/8/8 Plus/7/7+/6/6s? Actually there are some great apps to transfer videos from iPhone to iPhone. In this article, you will get lists and information on the best iPhone transfer software ever! There are a lot of free iPhone to iPhone transfer software on the internet. Here are the 4 best software/apps to transfer videos from iPhone to iPhone. AirDrop is developed by Apple which will help you to wirelessly send photos, videos, websites, locations, and more to a nearby iPhone. 1. Wirelessly transfer photos, videos, websites, locations, and more to an iPhone. 4. Supports iOS 7 or later and 2012 or newer model Mac with OS X Yosemite or later. Advantages: AirDrop lets you share files without being on the same Wi-Fi network. Let's you transfer files in faster speed with both Wi-Fi and Bluetooth on. Disadvantages: Only support specific iOS device (iOS 7 or later) and Mac (OS X Yosemite or later). iTunes is a media organizing and entertainment management software developed by Apple. You can also use it to transfer media files such as songs, videos, photos etc. from one iPhone to another. 2. Back up your device using iTunes. 5. Home sharing and download videos, movies or TV shows from the iTunes Store. Advantages:Free software and it has a good integration with iOS devices. Disadvantages: Sometimes runs slowly on computers. Shareit is a simple but very useful app to transfer videos from iPhone to iPhone. It's developed by SHAREit Technologies Co.Ltd and it's a very fast in transferring files. It uses Wi-Fi hotspot technology to transfer files and very effective when you don't have enough time to transfer big files. 1. Send, drag and drop files to transfer. 2. Transfer files in super speed using wireless connection. 3. Stream photos from an Android device to a PC. Advantages: We can transfer large files between two devices. No need for an internet connection. Disadvantages: It may hang low memory devices. Email is an easy and simple way to transfer videos or media files between iPhones. It's a method of exchanging messages between people by using electronic devices. You can use any Email Application or Web Based Emails to send an Email to someone. You can not only send text messages but also send media files via an Email. 1. File attachment system to send media files. 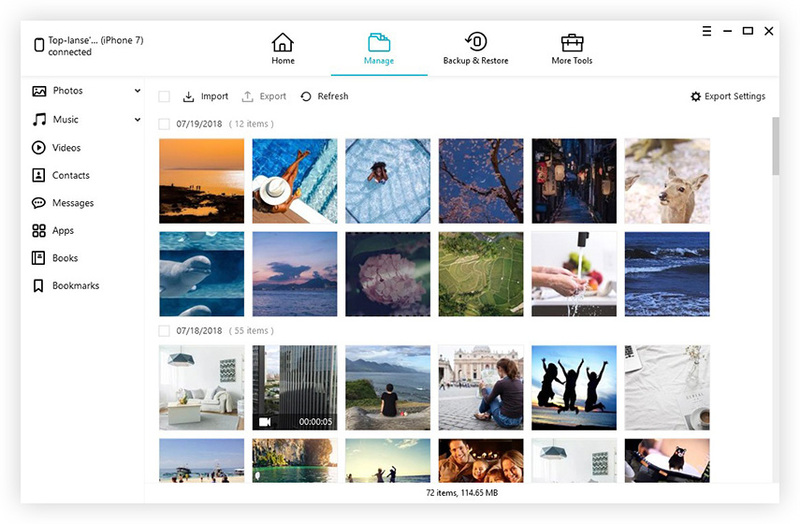 Advantages: You can easily send and receive media files. Disadvantages: Only small videos, photos, or documents can be shared at a time. Tenorshare Phone to Phone Transfer is the best iPhone transfer software developed by Tenorshare. It's a PC/Mac based software that is meant to transfer data from iPhone to iPhone/iPad/iPod touch. 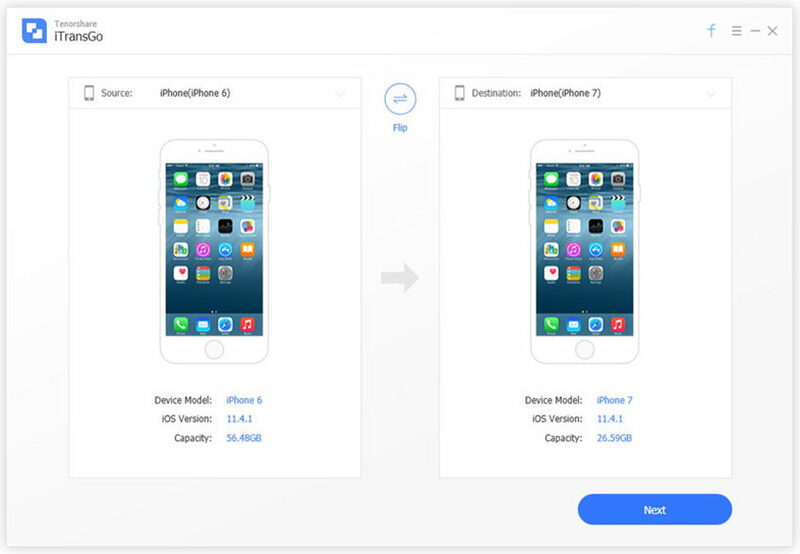 With only1-Click, you can clone everything from Old iPhone to a New One. It's a great tool that will allow you to transfer data from one iPhone to another in the easiest way. 1. Transfer data between any iOS device and any iOS version. 2. 1-Click feature to Clone Everything from Old iPhone to a New One. 3. Sync music between iPhone, iPad and iPod. 4. Sync app data when changing your device. Advantages: Data quality stays like original when recovered. Disadvantages: No option to scan selective folder, you need to scan the entire drive. AnyTrans is an iPhone management software that can help you to transfer Music, Playlists, Photos and more from iPhone, iPad, iPod to PC/Mac/iTunes. It has a very simple interface and functionalities that can be understood easily, but it's very effective when it comes to iPhone management and file transfer. You can easily use it to transfer videos from iPhone to iPhone. 1. Manages, transfer sand backups up to 25 types of data files. 2. Realizes both-way transfer between Device and Computer, Device and iTunes, Device to Device. 3. Automatically makes any videos perfectly fit to every Retina display. Advantages: Synchronize and back up files between your iOS, Android, Windows and Mac devices. Manage your iTunes and iCloud data and files. Disadvantages: You can't use it to transfer from iOS to Android or other devices without a computer. It's a useful iOS data transfer for iPhone, iPad with Windows or Mac. It will also help you to easily manage iOS files with computer. EaseUSMobimover is a user-friendly iPhone transfer software for iOS devices. It works as a professional iPhone managerthat can help you transfer, add, delete data with a few clicks! 1. Back up, share files and sync data. 2. One click transfer from iPhone to computer. Advantages: Various features with all kinds of import and export system. Disadvantages: Same features like any other software, nothing special. CopyTrans is an easy solution to transfer photos, videos, music etc. from iPhone, iPad and iPod to PC or iTunes. It's a very efficient data transfer software that can import, backup and restore your important data from iPhone, iPad and iPod. You can even backup your iTunes library by using this software. 1. One-Click transfer of iPhone music and videos to iTunes. 2. It supports all iPhone, iPad and iPod models and was designed for Windows 10, 8, 7, Vista and XP. 3. Transfer music from iPod to computer. 4. Import, backup and send music, videos, apps from iPhone, iPod Touch and iPod to PC. Advantages: It's renowned as a secure and stable application. Disadvantages: The interface isn't as easy or intuitive, and hard to understand. You cannot share iPhone data with your friends or family. There is a lot of software to transfer videos from one iPhone to another but the best among them is Tenorshare phone to phone transfer software. It's undoubtedly the best iPhone transfer software. You can use this software to transfer videos from your old iPhone to new iPhone easily in a very short time.